Brian David Griese (/ˈɡriːsi/; born March 18, 1975) is a former American football quarterback and former radio color commentator for the Denver Broncos. He was drafted by the Broncos in the third round of the 1998 NFL Draft. He played high school football at Christopher Columbus High School and later college football at Michigan. He has also played for the Miami Dolphins, Chicago Bears and Tampa Bay Buccaneers. A Pro Bowl selection with the Broncos in 2000, Griese earned a Super Bowl ring with the team, as the third-string quarterback in Super Bowl XXXIII over the Atlanta Falcons. He is the son of Hall of Fame quarterback Bob Griese. Griese played college football at the University of Michigan from 1993 to 1997. Michigan did not offer him a scholarship, so he walked on to the football team. He turned down scholarship offers from Purdue and Kentucky. After he was redshirted in 1993 and limited to placeholding duties in 1994, Griese took over as the starting quarterback after Scott Dreisbach was injured five games into the 1995 season. Griese started for the remainder of the 1995 season, capped by an upset of #2 ranked Ohio State, 31–23. 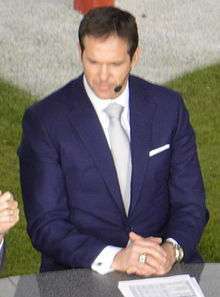 In 1997, Griese remained the starter. Along with Heisman Trophy winner Charles Woodson, he led the Wolverines to an undefeated season and the national championship. Griese was selected as the MVP of the 1998 Rose Bowl, passing for 251 yards and three touchdowns in Michigan's win over Washington State. Griese consistently completed a high percentage of his passes. He has had four seasons with a better than 64% completion rate, including one year (2004) when he completed 69.3% of his passes. Nevertheless, he was unable to establish himself as one of the elite quarterbacks of the league, due to injuries, subpar arm strength and a penchant for interceptions. He was released by the Broncos, following the 2002 season, and was replaced by former Cardinals starter Jake Plummer. After signing with the Bears, Griese saw limited action. Though he fared better than Rex Grossman during the 2006 preseason, coach Lovie Smith decided to keep Griese as the Bears’ second string quarterback. He took late fourth quarter snaps at the end of major victories. Though Grossman started every Bears game in the 2006 season, Smith allowed Griese some extended gametime during week fifteen, after the Bears had clinched home-field advantage throughout the playoffs. In a game against the Detroit Lions, Griese completed six of nine passes for 51 yards, which set up several game-winning Robbie Gould field goals. Smith called on Griese to relieve a struggling Grossman for the second half of the final regular season game against the Green Bay Packers. However, Griese did not fare a lot better, completing 5 of 15 passes for 124 yards, one touchdown and two interceptions. While some Chicagoans questioned Grossman’s ability to lead the Bears to the Super Bowl, Smith stood by Grossman, and declared him the team's starter throughout the playoffs. The Bears went on to win the 2006 NFC Championship, but lost Super Bowl XLI to the Indianapolis Colts. After Grossman struggled during the first three outings of the 2007 Chicago Bears season, Smith turned to Griese to lead the team. In his first outing as a Bears starter, Griese threw two touchdowns and three interceptions in a losing effort against the Detroit Lions. The next week, he led the Bears on a game winning drive against the Philadelphia Eagles, in which he called the plays due to a headset failure. Griese lost the starting job to Grossman after sustaining an injury against the Oakland Raiders during week ten. Griese again replaced Grossman later in the season, after Grossman sustained a knee injury against the Washington Redskins. However, with the Bears out of the playoffs, Kyle Orton started the remaining 3 games of the season. ↑ NFL Game Center: Box Score - Chicago Bears at Detroit Lions - 2007 4 Archived October 11, 2007, at the Wayback Machine. ↑ Fendrich, Howard (December 7, 2007). "Backup leads Redskins past Bears 24-16". USA Today. Retrieved April 26, 2010. ↑ "Bears trade Brian Griese to Tampa Bay :: CHICAGO SUN-TIMES :: Sports". Archived from the original on May 13, 2008. ↑ Kaufman, Ira (July 13, 2009). "Bucs cut Griese, sign third-round pick". Tampa Tribune. Archived from the original on 2009-07-22. Retrieved 2009-07-13. ↑ "Brian Griese Stats". ESPN. ESPN Internet Ventures. Retrieved 24 June 2014. ↑ Rice, Mike (July 31, 2012). "Eddie Mac is Back". denverbroncos.com. Retrieved July 31, 2012. ↑ "Griese Awarded with Big Ten's Ford-Kinnick Leadership Award". MGoBlue.com. CBS Interactive. November 24, 2015. Retrieved November 24, 2015.